The author, thinking about his boat instead of working. 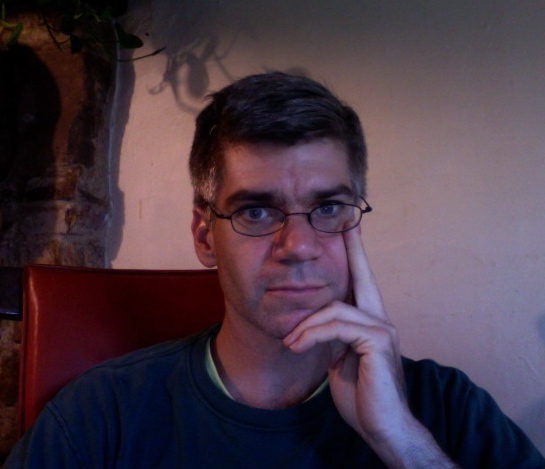 Paul Boyer is a full time writer focusing on issues related to American higher education. Recent books and reports include College Rankings Exposed and Building Community: Reforming Math and Science Education in Rural Schools. He lives near Ithaca, New York with his wife and their three children. Hobbies include gardening, woodworking and–now–boat building. I recently discovered your blog and have read every word with complete understanding. You see, I have been suffering from the same symptoms recently. For some inexplicable reason, I, too, have been visiting the lumberyards and home centers. My garage has become my boatyard as I have slowly but methodically made longer boards from shorter ones, applied strange and new adhesives, driven an endless stream of stainless steel screws and endured the odd looks full of less-than-understanding meaning from those who should have been my friends. And yet I cannot stop until it is finished. What’s more, I live in the desert. I am hundreds of miles from the ocean, nearly a 5-hour drive. There is a lake nearby, one that continues to lower its waterline almost daily, something to do with a 10-year drought and excessive urban growth. We have no navigable rivers. I can only hope that the lake doesn’t dry up before I finish. I have been known to be gleeful at the announced closing of two boat/marine supply stores here because of the “everything must go” clearance sales they have had. I endured the empty stares from the sales clerks when I inquired after marine-grade plywood at the lumberyard. My friends wonder at my change of elective reading from Revolutionary-era History to volumes with a more nautical theme. Some have even noticed that my metaphors have taken a turn to things with a boaty flair. They all assure me that this is just a ‘phase’ I’m going through, after all, I turn 50 next February. Must be that dreaded ‘mid-life crisis’ and it will be over soon and I will return to normal. Not likely. I have three more sets of plans they don’t know about. You have an understanding friend in the desert. I wish you fair winds and following seas. I would just like to add that I am contemplating my own ‘voyage’ into boat building for much the same reasons. It has been a great pleasure for me to read about your progress. Thanks for taking the time to write an account of your adventure so far. We had a great time last year. Looking forward to hearing more. I’m following your series on Duckworks. In “Confessions of a Novice Boat Builder”, you nailed it. I had a very similar experience about 7 years ago. I couldn’t decide if I should build an iceboat, kayak, rowing shell or a sailboat. I decided on building a kayak. The day I put it in the water for the first time after a three month build, I stopped at a gas station to fill up my car. The guy at the pump across from me looked up at the boat on my roof and asked, “Did you build that?” I answered “Yes” and he replied, “What the hell made you do something like that?” After reading your article, I think I’m finally able to completely answer that question. As a side note, the bug doesn’t go away after building your first. It’s true I have this singularly inexplicable malady – the misbegotten idea that building it may make me understand it better. The ‘it’ of course, is NOT “the boat”. Oh no, the friends and loved ones nod- that’s just the object whose creation I have assigned the quest. The fact that the ‘it’ is different for each of us goes unquestioned. Escape is a good one; Builder’s satisfaction ranks as high as bragging rights. What it may break down to though is the urge to create something unrelated to my chosen line of work which inspires as much passion the job did before the years at it started to accumulate baggage. As I sit here 2 miles west of the Chesapeake, the coats of enamel I put on MY Mill Creek 16.5 yesterday are curing (hopefully!) and the next step is to fasten on the deck, all those theories evaporate and the truth is as clear to me as the task if not the countless steps within it. I’m building it because it’s a BOAT. It’s not perfect and it’s not a piano, but it is mine. And that’s enough for me. on the duckworks-site I’ve read your article about Pete Stevenson. I’ll found a lot of interesting information about the face behind the famous weekender-plan. There is may an another detail about Pete here from abroad. Because I live in Germany, Hamburg, I’ve asked for plans in metric scale. Pete answered was unexpected:….he recommend feet and inches are better for boatbuilding because they are closer to nature. He argued, many things in nature can devided by twelve, the metric-system has more performance in sience and laboratory. I accepted and order plans in Jan.2009 for the Weekender, Pocket Cruiser and Vacationer at ones, to decrease the costs for shipping. Now I’ll decide and hope to start building the Weekender soon. I’ve turned 45:-) one child Lilly, 11 month. Best regards from the river Elbe. That’s an interesting argument, to say the least. I suspect Pete was just trying to avoid the work of converting the plans to metric scale. I hope you can find a tape measure with inches and feet. Perhaps Pete can send you one 🙂 Please stay in touch as your boat takes shape! Saw your article in Duckworks. What you plan is definitely do-able. I’ve just completed a 3500 mile run from just North of Phila. on the Delaware, down to the Gulf of Mexico and back to the Hudson River in my little 15 ft. AF4b (Jim Michalak design) without serious incident. It is also definitely worth doing. there are still many hundreds of miles on the ICW, and many more just off it, that are still just as pristine a wilderness as in 1492. A tabernacled mast, or one that is quickly and easily unstepped by one man, as there are many bridges and it is a great convenience not to have to wait for them. Also, low hanging branches in places like the Everglades can severely limit exploration with a stepped mast. Think about timing your departure, if going South, for midsummer; the big boats that head South in the Fall cover twice as many miles a day as you will. Waking up to 28º weather in Southern Georgia, in November is not fun (I know). I might venture further South. If that went well, then further South still. The point is that if i got no further than the Chesapeake I would have accomplished what I initially set out to do. This mind-set saved me a lot of the stress of pushing on towards a far distant goal. I hauled the boat in the lower Hudson in Sept. and trailered her back home, where I am now refitting her for a foray North on the Hudson in the Spring. How far North? I have no idea. You really captured my feelings about this adventure. Officially, my goal is to simply wander around the Chesapeake, but my “secret” dream is to do exactly what you did. Your story is very inspiring. Thank you! And don’t forget to send updates when you start sailing in the spring. I’d love to post some of you essays and photos. I just stumbled upon this blog and gave it a read through. I think it’s really great that you’re building your own boat rather than simply buying one like so many others do. I’m currently working at a summer camp with a creative/construction focus, and every year the campers band together and collaborate on a project that pushes them past what is expected of them in order to create something incredible. Your project furthers the idea that everything is attainable through a will and strong work-ethic, and I wish you the best of luck in this enlightening journey! Thanks for the great comments. Is boat building part of the program at the camp? I often see stories about programs that help kids build canoes and small sailboats in a few days or, in some cases, a few hours. Very cool. Actually, the reason I stumbled upon the blog was because of my campers. Our bunk-name is The BW Yacht Club for Gentlemen. For a regatta themed activity, I wanted the kids to build and float model boats out of treated cardboard, and I wanted to do a little research into the construction of an actual boats to gather ideas. Your blog was among the top three hits on google, and I got sucked in. I hope that construction is going well! well done and spot on. Hello, I really admire the work you´ve made with the boat, it´s great. I will start to build a boat also, in January, I´m in the phase of choosing the project. I might build one similar to yours. Can you tell me where you found the project of your boar, please. I would be very grateful. like the others before me, i have stumbled across this marvelous resource of inspiration. The “it”… could be a good name for a boat I suppose… but we all come here because of “it”. I have built, or partially built three airplanes in the past, and the first led to a failed relationship. the second and third attempt, well that nearly got me in the same boat, so to speak. and now that i’m getting older and the ol’ eyes are beginning to fade, the cost of being able to fly, etc…. well that led me to the next best thing for adventour, albeit, a slower mode. so now I have the nautical “it”. At least this time I can involve the family, as they can enjoy it with me. Both building, which was great when i was kid with my father, and sailing. Though I must admit, I’ll need to learn to that first. Living in the high desert leaves little to sail close by, but Tahoe is only a 90 minute drive away. I hope the build for you has gone well for you.